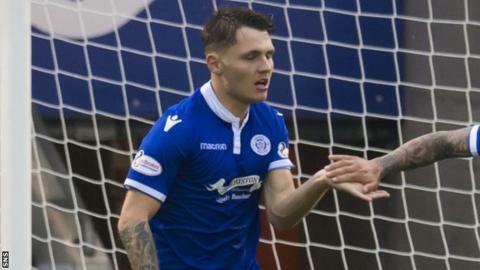 Jason Kerr's second-half effort was all that separated the sides as Queen of the South edged a win over Brechin City in a match which saw both teams reduced to 10 men at Glebe Park. Brechin's Ally Love and Kerr both saw red for violent conduct as tempers frayed in second-half stoppage time. Kerr had given his side the lead when he found the bottom corner after Connor Murray's corner was only half-cleared. The visitors close the gap on fourth-place Dundee United to two points. The hosts had the better of the first-half chances, with Sean Crighton testing goalkeeper Alan Martin before team-mate Connor McLennan's header sailed over the crossbar and Isaac Layne had an effort blocked. At the other end, Stephen Dobbie fired his free-kick wide and Derek Lyle headed off target on the brink of half-time as the Doonhamers struck back with a couple of chances of their own, but the scores remained level at the break. Lyle again went close with a barrage of headers as the visitors looked to break the deadlock after the break and their pressing paid off when Kerr gave them the all-important goal. Match ends, Brechin City 0, Queen of the South 1. Second Half ends, Brechin City 0, Queen of the South 1. John Rankin (Queen of the South) is shown the yellow card. Jason Kerr (Queen of the South) is shown the red card for violent conduct. Ally Love (Brechin City) is shown the red card for violent conduct. Attempt missed. Aron Lynas (Brechin City) header from the right side of the six yard box is close, but misses to the left. Corner, Brechin City. Conceded by Scott Mercer. Foul by Jason Kerr (Queen of the South). Attempt missed. Aron Lynas (Brechin City) right footed shot from the centre of the box is close, but misses the top right corner. Delay in match Sean Crighton (Brechin City) because of an injury. Attempt saved. Stephen Dobbie (Queen of the South) right footed shot from the centre of the box is saved in the bottom left corner. Foul by Darren Brownlie (Queen of the South). Substitution, Brechin City. Finn Graham replaces Jordan Sinclair. Substitution, Brechin City. Ally Love replaces Connor McLennan. Substitution, Queen of the South. Callum Tapping replaces Connor Murray. Foul by John Rankin (Queen of the South). Connor McLennan (Brechin City) wins a free kick in the attacking half. Substitution, Brechin City. Kalvin Orsi replaces Isaac Layne. Darren Brownlie (Queen of the South) wins a free kick in the attacking half. Isaac Layne (Brechin City) wins a free kick on the right wing. Attempt saved. Stephen Dobbie (Queen of the South) right footed shot from outside the box is saved in the bottom right corner. Goal! Brechin City 0, Queen of the South 1. Jason Kerr (Queen of the South) left footed shot from the centre of the box to the bottom right corner. Corner, Queen of the South. Conceded by Graeme Smith. Attempt saved. Derek Lyle (Queen of the South) header from the centre of the box is saved in the bottom right corner. Corner, Brechin City. Conceded by Alan Martin. Attempt saved. Isaac Layne (Brechin City) header from the centre of the box is saved in the bottom left corner. Foul by James Dale (Brechin City). Attempt saved. Isaac Layne (Brechin City) right footed shot from the centre of the box is saved in the centre of the goal.